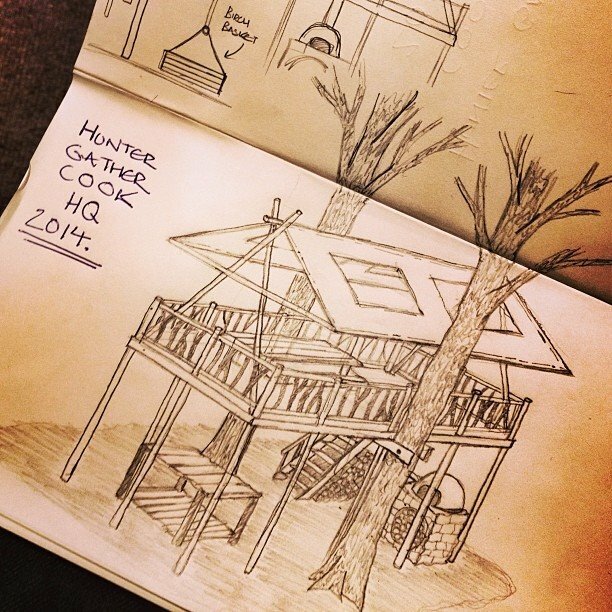 Kickstarter: Tree House HQ at Hunter Gather Cook. Kickstarter treehouse HD from Nick Weston on Vimeo. Ever since building a tree house and living in it and off the land, it has always been a dream to go back to the roots of where Hunter Gather Cook began and build a tree house HQ in which to run all our courses. Today the project went live on kickstarter, we are looking for £5k to build a 9m by 4m tree house in the woods with a brand new off-grid kitchen. Please have a look at what our tree house vision is here including a nice little video of what we have planned- we have some pretty awesome rewards too, so we may see you up in the trees in May! As for the arrival of spring, here are some damn fine recipes to get stuck into at this time of year, personally, I would strongly advise the Nettle beer! Nettle beer: a refreshing brew that comes out at 6.4% tastes like a cross between cider and a white wine spritzer...ready in 2-3 weeks. Wild stinger Pesto Balls: Ideal for those that are vegetarian, even better for those that want something to go with their meat! Goes very well with saddle of rabbit. Red Dead Nettle: a spring side dish- coming into season now. Potted Rabbit: Now the suns out, rabbit will be out in the fields lining up for the gun- a great recipe to make the most out of your bunnies! All our courses for 2014 are online and filling up quickly, so do check out the website to see if anything tickles your fancy. The Deer in a Day course seems particularly popular this year and there are only two dates available- so get in quick! We will once again be headlining the deer stage at Wilderness Festival this year, foraging too and we are also doing the Kids camps on the friday and saturday with a limited number of 120 places for an overnight wild food adventure for 8-14 year olds- due to go on sale soon through the Wilderness website soon. Look forward to seeing you in the woods soon...to the TREES! !